Parkinson Voice Project is grateful for the many individuals and community groups who have planned fundraising events to support its mission. If you are interested in planning a fundraiser to help preserve the voices of those with Parkinson’s, send an email to contact@ParkinsonVoiceProject.org. Running For Voices: A group of professionals participated in the Dallas Marathon and obtained sponsorships to benefit Parkinson Voice Project. Beekeeping: A hard-working beekeeper (and his busy bees) gave away cute honey bears filled with spring honey in return for donations made to Parkinson Voice Project. Model Railroading: After a lifetime hobby of model railroading, a grateful LOUD Crowd member sold his collection and donated the money to Parkinson Voice Project to Pay It Forward. Water Bottle Drive: Several community groups and sports teams have generously donated bottled water to our organization. Drinking water is important during speech therapy; however, tremors can make it difficult to hold a cup of water steady. For this reason, Parkinson Voice Project uses 8-ounce water bottles during its therapy sessions. 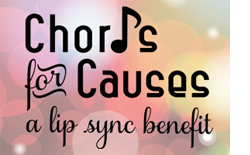 Chords for Causes: On September 2, 2015, the DFW Chapter of the National Association for Catering and Events hosted their first ever LIP SYNC BENEFIT to help those with Parkinson’s who struggle with producing clear, audible speech. Jeans Day: Several groups have hosted a “Jeans Day” at their offices. Let everyone enjoy a casual “jeans day” in return for making a donation to Parkinson Voice Project. A Linda Ronstadt Tribute: A group of professionals who love to play music and sing sponsored a “Linda Ronstadt Tribute” at a local coffee house to raise money for Parkinson Voice Project. Resounding Harmony: In June 2016, Resounding Harmony, a volunteer chorus whose mission is to support worthy causes through their musical talents, will host a concert to benefit Parkinson Voice Project. For more information about Resounding Harmony, visit resoundingharmony.org. BBQ or other Dinner Fundraiser: Invite friends and neighbors over for dinner. Display a jar for donations, along with informational materials, which Parkinson Voice Project will provide. Community Garage Sale: Organize a neighborhood garage sale or yard sale. Kids can host a bake sale or set up a lemonade stand. Make Change with Change: Encourage friends and family to collect loose change throughout the year, and offer an incentive for the group that donates the most money.